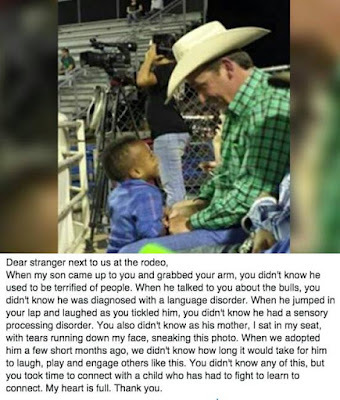 This Little Boy Walks Up To A Complete Stranger At A Rodeo And His Life Is Changed Forever! 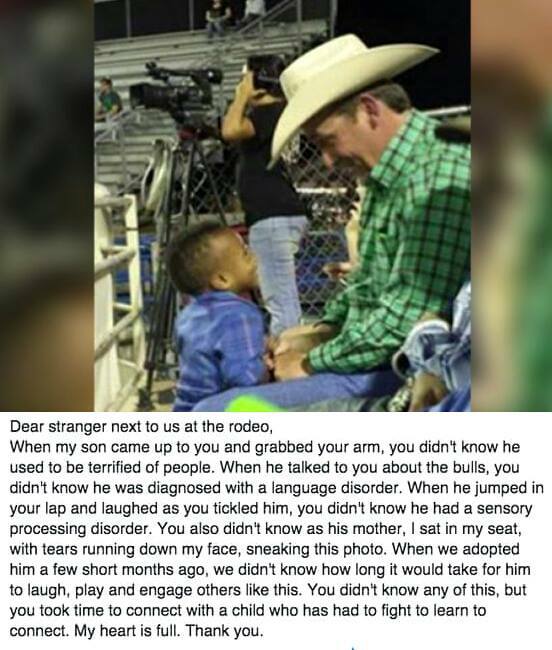 Subject: Fw: This Little Boy Walks Up To A Complete Stranger At A Rodeo And His Life Is Changed Forever! "I have a large amount of respect for parents who adopt children in need of a good home. Just as animals who have been abandoned need to find a loving family, young children are often left without loved ones to care for them. I very much admire parents who are open-hearted enough to welcome a child into their home. So when I saw this story about a couple who adopted a young boy named Lincoln, I immediately wanted to know more. But his adoption was just the tip of the iceberg. Charity and Brenton Robinson live in Gladewater, TX. They adopted Linc, as he is affectionately known, who they now love and care for as their son. Unfortunately, Linc suffers from several language and sensory disorders that make him terrified of other people, neither wanting nor being able to communicate. Charity and Brenton feared that Linc would never be able to live a normal life. That is, until something absolutely incredible happened at the rodeo one day."